This is about Aerican, one of the main avatars in The Thang. Let's look at Aerican, the main character. Kanhoa is a big tribe. Although they form a village, they do not always live in groups. They originate from the Rian. They are nomadic; they move around freely in small groups, usually family, and live on game they hunt in the forest. They sometimes are involved in tribal disputes for profit. They use tents that are easy to carry, and they usually live in temporary houses built on trees. Aerican is a superb hunter. He is good with bows and old guns excavated from the ancient ruins. He is a good long-distance shooter. The following diagram is the initial stats of Aerican at Level 1. 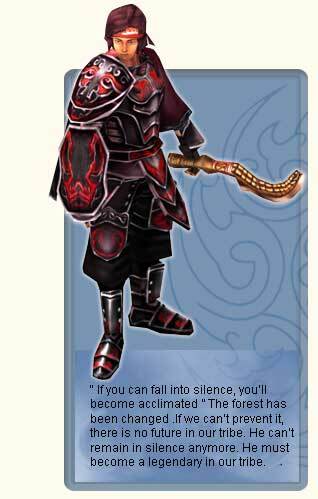 Aerican with swords - The higher the Strength and Sense are, the stronger the attack level of swords becomes. Aerican with boomerangs - The higher the Sense and KI are, the stronger the attack level of boomerangs becomes. Aerican with bow - The higher the Dexterity and Sense are, the stronger the attack level becomes.